We were more than a little proud to hear this week that we’ve won a Gold Award in PR Week’s Best Places to Work following a rigorous judging process. In the process, being declared the best mid-sized agency to work for in the UK. Apparently there were over 100 agencies in the running so we’re well and truly chuffed that we were even on a shortlist. In an equally tough group, Hope&Glory, the consumer agency formed just four years ago, pipped its rivals to the post, with judges commending its approach to staff wellbeing. Hope&Glory’s training programme Rise&Shine was recognised for its thoroughness, encompassing a graduate training scheme and a monthly ‘lunch and learn’ session, along with external training courses. Every employee has undergone media training in the past year, and the agency has even put all staff – from intern to partner – on a personal impact training course from RADA (the Royal Academy of Dramatic Art). Also offered is management coaching for senior staff (associate director and above), a proofreading course for junior employees, and team management training for senior account managers. Employees receive six to eight hours of training each month. The bonuses on offer are generous – 30 per cent of total profits are paid out in staff bonuses, a figure equivalent to 15 per cent of the total salary pool. Interns, meanwhile, are paid the London Living Wage at Hope&Glory, and the agency sees the scheme as a useful recruitment tool – an impressive 70 per cent end up working for the company. Hope&Glory offers full pay to mothers for the first 12 weeks, with half pay offered up to week 18. A flexible approach is employed for returning parents, with the agency making it clear that working hours can be changed to accommodate their new responsibilities. 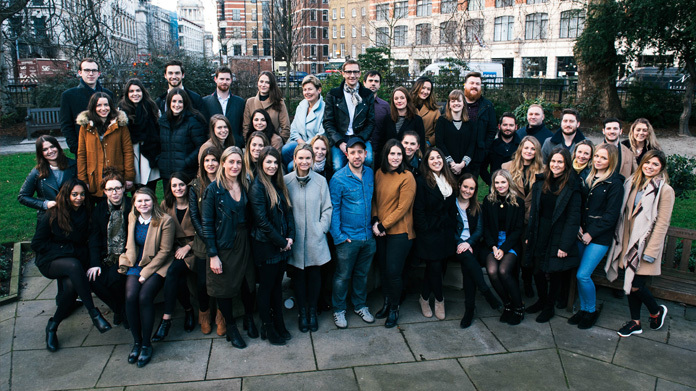 Across its entire four-year history only five full-time employees have left Hope&Glory’s currently 47-strong team – a telling statistic that points to a winning approach.